This satin chrome flush bathroom ceiling light with marble glass shade is rated IP44 and features a circular mount, with brushed chrome surround and domed central shade. Designed for bathroom use but also suitable for corridors and low ceiling living spaces. The domed marble glass shade is surrounded by a steel frame that is finished in flat chrome. The simple details allow this flush fitting to suit both a traditional or modern bathrooms. 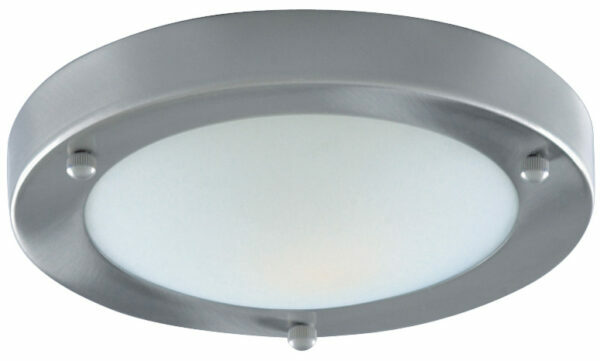 A stylish bathroom ceiling light that looks fantastic in period, traditional and contemporary bathrooms alike. Rated IP44 and suitable for zones 1 and 2. Specifically designed for use in bathrooms but can be used anywhere inside your home except wet rooms. This bathroom light is supplied by Searchlight who manufacture some of the best traditional and modern classic designs such as the satin chrome flush bathroom ceiling light with marble glass shade you see here.